Located about 25 miles west of Bend, the peaks of the Three Sisters Mountains grace the skyline of Central Oregon with each reaching over 10,000 feet. A trio of picturesque, potentially active volcanoes once named Faith, Hope, and Charity. Located just 25 miles west of Bend in the beautiful Three Sisters Wilderness. Hike up the South Ridge of South Sister, or explore miles of other trails in the area. Enjoy Central Oregon’s stunning scenery while mountain biking near Three Sisters. The Three Sisters Mountains are a picturesque trio of volcanoes located west of Bend in the beautiful Three Sisters Wilderness. The next highest peaks in Oregon after Mt. Hood and Mt. Jefferson, each of the Three Sisters exceeds an elevation of 10,000 feet. Members of a Methodist mission reportedly named them Faith, Hope, and Charity in the 1840s. Part of the scenic Cascade Range in Central Oregon, the Three Sisters Mountains are a popular location for outdoor enthusiasts who enjoy activities such as hiking, backpacking, climbing, and camping. Three Sisters Oregon are a trio of mountains located about 25 miles west of Bend in the Deschutes National Forest. Contact Information: Sisters Ranger District, PO Box 248, Sisters, OR 97759. Phone: 541-549-2111. Hiking and Climbing – The area surrounding the Three Sisters has many scenic hiking trails that vary in degree of difficulty and length. Hikers in decent shape can enjoy climbing South Sister via the South Ridge, beginning at either Devil’s Lake or Green Lakes. The climb is long and steep, but doesn’t require technical skills. The North Sister is the most difficult and dangerous to climb, and requires technical expertise. There are over 260 miles of trails in the Three Sisters Wilderness. Mountain Biking – There are a variety of scenic trails in the area that are excellent for mountain biking in the summer and early fall. The elevations of the respective peaks are South Sister – 10,363 feet; Middle Sister – 10,047 feet; and North Sister – 10,085 feet. 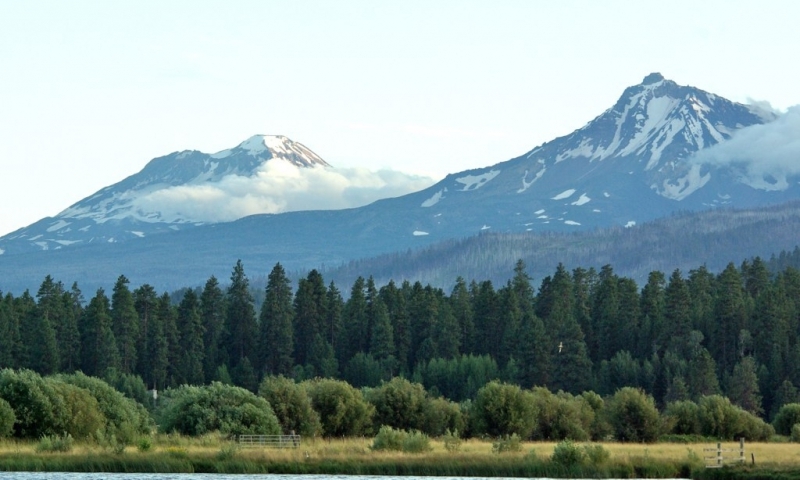 The North Sister is a shield volcano, and the Middle and South Sisters are stratovolcanoes. All are considered potentially active per the USGS, with the South Sister erupting as recently as 2000 years ago. Activity was detected 3 miles west of the South Sister in 2001 by a satellite. The highest lake in Oregon, known as Teardrop Pool, rests in a small crater at the South Sister’s summit. There are 15 named glaciers in the Three Sisters, Oregon.